Maggie's soothing voice and specially composed music will lead you on an effortless journey to find solutions and resolve problems in any aspect of your life. During the course of 20 minutes, you will find yourself relaxing into a deep source of nourishment and wisdom, finding answers to both everyday questions and pressing problems. You can return as often as you like to plumb the depths of your own inner wisdom – a source of direction beyond your usual ‘thinking mind’ that is wise, trustworthy and leads to the very best outcomes. 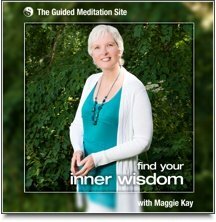 Suitable for experienced meditators and novices alike, Find Your Inner Wisdom is an easy, enjoyable meditation that will delight you with its beauty and power. A short relaxation exercise that you can use to unwind at any time. A slightly shorter version of the 'Find Your Inner Wisdom' journey. The full 'Find Your Inner Wisdom' journey, complete with breathing relaxation and body stretch. The full 'Find Your Inner Wisdom' journey, complete with breathing relaxation and body stretch. The "body stretch" is simply a series of gentle movements that are experienced as part of the meditation while sitting down with your eyes closed. This early part of the meditation journey gives optimum access to feelings of relaxation and engagement, melting away preoccupations and allowing the remaining meditation to be experienced more deeply.